Here's a bed quilt pattern that's sewn with just one type of quilt block, a design called Star Crossing. The quilt blocks are separated by sashing and cornerstones that extend into an inner border. Strip pieced patchwork bars are used to create an outer piano key border. The piano key's Finish at four inches long and are created with strip piecing techniques. Black keys link up with the black cornerstones used in the sashing to make it appear that the black keys are longer than the others. Cut longer strip sets for keys if you prefer, but be sure to add extra yardage for the colors used in the border. The quilt block and its borders can be very orderly as illustrated, or completely scrappy. I like the white background and feel that it gives the quilt a contemporary look, but change colors in any way that suits your needs. All patchwork in the block is assembled using quick piecing techniques. The quilt finishes at 70" x 94". Adjust borders and blocks to create a larger or smaller quilt. Accuracy is important when you make any quilt, but it's critical when you sew a quilt that must match up with patchwork sashing and a patchwork border. Check your quarter inch seam allowance before you begin to sew. Cut just enough fabric to make sample blocks before cutting all patches that are required (true for any pattern). Press to set seams before you press seam allowances to one side. Yes, it's an extra step, but worth the effort. Use chain piecing to speed up assembly once you're familiar with a step. Instructions include measurements -- check your patchwork before moving on to the next step. Label your fabrics -- the pattern refers to fabrics by letter. Used in borders, sashing, and for star points in quilt blocks. The other materials you'll need depend on the type of quilting and binding planned. Use my suggestions as a guide. A panel about 82" x 106". This may involve making quilt backing. About the same size as the quilt backing. About 355 running inches of continuous double fold binding strips. I use strips that are 2-1/4" to 2-1/2" wide (before folding). Many quilters prefer narrower strips. 3/4 yard should be plenty for 2-1/4" strips. The Star Crossing quilt block can be assembled in many ways. We'll use a streamlined method that incorporates a few quick piecing techniques. The quilt is designed with 35 Star Crossing quilt blocks that are arranged into seven rows of five blocks each. Quilt blocks finish at 10" square. Cut patchwork shapes from long strips of fabric cut from selvage to selvage. Work with shorter strips if you have problems cutting accurate long strips. Fat quarters and fat eighths are good choices if you plan to make a scrap quilt. Cut (140) 3-1/2" x 3-1/2" squares of Fabric C.
The main body of corner patchwork is a square-in-a-square quilt block with quick-pieced corners. 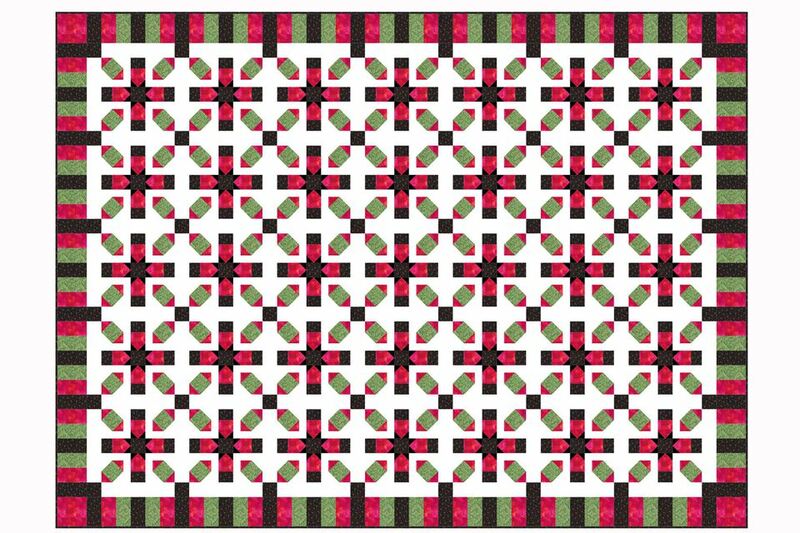 All of the square-in-a-square blocks are the same, but Fabric D bars are sewn to the units in two ways to create mirror image pairs. Draw a diagonal line from one corner to the opposite corner on the reverse side of each 2" square cut for corner units (Fabric B and Fabric E). Use a hera marker to make creases if you prefer (if you plan to sew right away). Put chain piecing to work, and the sewing tasks will go quickly. Follow the upper illustration from left to right in each row. Grab one Fabric C square and two 2" squares of fabric B. Place a Fabric B square in the upper right corner of the C square, right sides together and the drawn line as shown. Carefully match all edges. Sew a seam directly on the line. Cut through both layers about 1/4" past the seam. Press to set the seam and then flip the triangle right side up, pressing the seam allowance carefully towards the triangle. Use the same method to sew the second B square to the opposite side of the larger square. Sew the two E squares to the remaining edges of the C square. Press seams either direction. Make a total of 140 square-in-a-square blocks that measure 3-1/2" x 3-1/2". Assembly is much faster if you align all squares for one corner of each larger square and send them through the machine one after the other. Press all to set the seams, trim, and then press the allowances. Count out 70 of the square-in-a-square blocks. Refer to the bottom left illustration. Align a block with the Fabric B triangles pointing as shown, left upper and right lower. Sew a 1-1/2" x 3-1/2" Fabric E rectangle to the bottom of the square-in-a-square. Press to set the seam (always) and then press the seam allowance towards the rectangle (unless the fabric is so sheer that the allowance will show through from the front). Sew a 1-1/2" x 4-1/2" Fabric E rectangle to the right edge of the patchwork. Press seam allowance either direction. The block corner should measure 4-1/2" x 4-1/2". If it doesn't, determine why and adjust sewing for the next unit. Make a total of 70 corners with rectangles arranged in the same way. You should have 70 square-in-a-square blocks left. Refer to the bottom right illustration. Align a square-in-a-square block as shown -- the triangles point in the opposite direction as the triangles in the first 70. Sew a 1-1/2" x 3-1/2" Fabric E rectangle to the bottom of a square-in-a-square. Press as before. Sew a 1-1/2" x 4-1/2" Fabric E rectangle to the left side of the block. Press as before. Make a total of 70 identical units that measure 4-1/2" square. Cut (35) 2-1/2" x 2-1/2" squares of Fabric D.
You may need to strip piecing tips. Sew a 3" x selvage width Fabric B strip lengthwise to a 2" x selvage width Fabric D strip. Press to set the seam -- you might not have done that for the other patchwork, but it's important here. Press the seam allowance either direction. Measure the strip set. Overall, it should be 4-1/2" wide along its entire length. Square up one end of the strip set and then cut as many 2-1/2" segments as possible. Create more strip sets and cut a total of (140) 2-1/2" segments. Sew two 2" Fabric A squares to the Fabric B end of each segment. Use the same quick piecing method you used for the square-in-a-square block corners. You might need to mark very dark diagonal lines with a light pencil or chalk marker. Midpoint units should each measure 2-1/2" x 4-1/2". Arrange four corner units, four midpoint rows, and one center square as shown. Check to make sure all angles are oriented correctly and that the little triangles at the ends of midpoint units are next to the block center. Sew the patchwork in each row together. Press seam allowances towards the midpoint patchwork units. Sew the rows together. Press. The quilt block should measure 10-1/2" x 10-1/2". Repeat to make 35 Star Crossing quilt blocks. Cut (42) 2-1/2" x 10-1/2" Fabric E sashing rectangles (you'll need more rectangles later). Gather five quilt blocks and sew a sashing rectangle between each to create a row. Sew a sashing rectangle to the beginning and end of each row. Press seam allowances towards the sashing unless it is very light (for less bulk). If the seam allowance would be too visible, press towards the blocks. The row should measure 10-1/2" x 62-1/2". Don't panic if it's slightly off. Repeat to make six more identical rows. Cut (40) more 2-1/2" x 10-1/2" Fabric E sashing strips. Cut (48) 2-1/2" x 2-1/2" Fabric A squares for cornerstones. Create eight cornerstone/sashing rows as shown. Each row begins and ends with a 2-1/2" square cornerstone. Press seam allowances towards the sashing (or towards the cornerstones if you pressed sashing towards blocks in the row steps above). Press with care to avoid stretch. Sew a sashing/cornerstone row between rows of quilt blocks/sashing, matching seam intersections carefully. Sashing rows are illustrated between, but not sewn, to the quilt top. Sew a sashing/cornerstone row to the top and bottom of the quilt top. If you search the Internet, you'll see many versions of piano key borders, but they all have one thing in common. The borders are made with long 'keys' sewn side by side. Some are more narrow (and longer) than the version in the Star Crossing quilt. The black strips of the borders match-up to the black cornerstones in the sashing, making those keys appear longer than the others. Alter the position of strips in the strip sets to create a different appearance. You can make the keys longer than shown, but you'll need to create additional strip sets (and increase yardage). Use a scrappy assortment of fabrics if you prefer. Take a look at a piano key border on one of the quilts made during our 2015 New Year's Day mystery quilt event. Mary Jane Cardwell configured her keys differently, creating a narrow outer border with squares strategically placed to make more keys different lengths. Cut (6) 2-1/2" x selvage width strips each of Fabric A, Fabric B, and Fabric C.
Cut (4) 2-1/2" x 4-1/2" Fabric A rectangles. Cut (4) 4-1/2" x 4-1/2" Fabric B squares. Use strip piecing to assemble the borders. Grab two 2-1/2" x selvage width strips of each Fabric -- A, B, and C.
Sew strips together lengthwise in this order: A, B, C, A, C, B. Refer to the top illustration. Begin each new seam at the end where the previous seam stopped to help keep the strip set from bowing. Press to set the seams (very important for this step) and then press seam allowances away from the black strips (the direction is only important for black strips). Square up one end of the strip set. Cut as many 4-1/2" segments as possible. Make three more identical strip sets and cut a total of (24) 4-1/2" segments. Refer to the middle illustration. Sew five segments together as shown (with the Fabric A-strips are positioned to the left). Sew a 2-1/2" x 4-1/2" Fabric A rectangle to the right edge of the strips. Press new seam allowances towards the Fabric A strips. Make one more identical row. Sew one of the borders to the top of the quilt and the other to the bottom, matching the Fabric A strips to the Fabric A areas of sashing and easing in any differences. Press seam allowances towards the new border. Make two more borders in the same way, but with seven segments each. Sew remaining 2-1/2" x 4-1/2" Fabric A rectangles at the right end as shown and then sew a 4-1/2" x 4-1/2" Fabric B square to each end of each border. Press seam allowances towards the Fabric A strips. Sew one of the new borders to each side of the quilt, matching carefully as before. Press the quilt again and mark for quilting if necessary. Make a quilt sandwich with the quilt top, batting, and backing. Baste the layers together with hand stitches, safety pins, adhesive products or another method. Quilt the quilt by hand or machine. Remove excess batting and backing, squaring up the edges of the quilt very carefully if necessary. Use your continuous binding strips to sew easy mitered binding around the edges of the quilt or finish the edges in another method of your choice.